State underwater archaeologists were pleasantly surprised recently to find two more cannons to add to the growing number found at the Queen Anne’s Revenge shipwreck site in Beaufort Inlet. Divers were about to close down the site for the fall dive season on Oct. 23 when they found two carriage guns north of a larger pile of cannons in the mid-ship section, according to John Morris, deputy state archaeologist who oversees the QAR project. “We didn’t expect to find these guns,” he said. This brings the total number of cannons discovered at the pirate Blackbeard’s flagship to 27. One of those is a signal gun, which is on display at the N.C. Maritime Museum in Beaufort, responsible for curatorship of QAR artifacts. Mr. Morris said the cannons would remain on the ocean floor until a future dive season. The goal is to retrieve all remaining artifacts, including 14 cannons, by 2014. Mr. Morris said the two cannons would have been mounted in carriages with wheels and sat on the ship’s deck. Dave Moore, archaeologist with the N.C. Maritime Museum, was diving at the site the day the cannons were found. He said they’re about 4-foot long and would have shot a 1.5-pound cannonball. 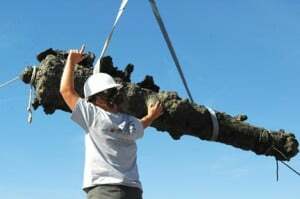 The cannons add to the 280,000 artifacts discovered at the shipwreck site, which was found in 1996 by Intersal Inc. of Boca Raton, Fla. The site was turned over to the State of North Carolina in 1997. Many of the artifacts have already gone through the conservation process and are on display at the N.C. Maritime Museum. Thousands of others are going through the cleaning and conserving process at the QAR lab at East Carolina University in Greenville. The conservation process is slow and painstaking, with archaeologists removing layers of crust and salts that have built up for the 300 years they have remained on the ocean floor. Blackbeard’s flagship plundered merchant ships in 1717 and 1718 off the coast of the Carolinas, with records indicating it sunk in 1718 after being abandoned by Blackbeard.